I have lit the signal fires and summoned the hosts to WARRRRR! Or at least a nice cup of tea and a chocolate biscuit. It's all the Mad Padre's fault, really. Positively forcing me to play War of the Ring and trotting out his 28mm Lord of the Rings troops on numerous occasions. He got me feeling all Middle Earthy. Then he says he's ordering some Wild Men from Vendel and would I like to add a few packs to the order? So what do I want from some Middle Earth gaming? No crossbows! Not in the books, so there you go. 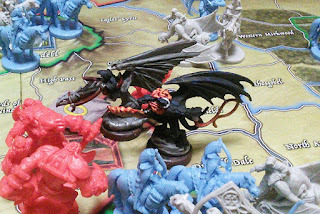 Of course everyone does the War of the Ring to death. If you go earlier into the background, there is fertile ground in the early Third Age with the men of Arnor and Eriador fighting the Witch King of Angmar. 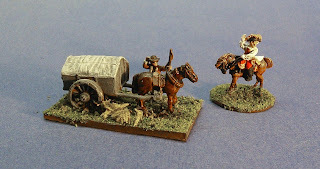 These are the fellows who held Weather Top and left behind the barrow-downs where Frodo and company nearly come to an early end. I'm thinking something like T.A. 1000 or so. 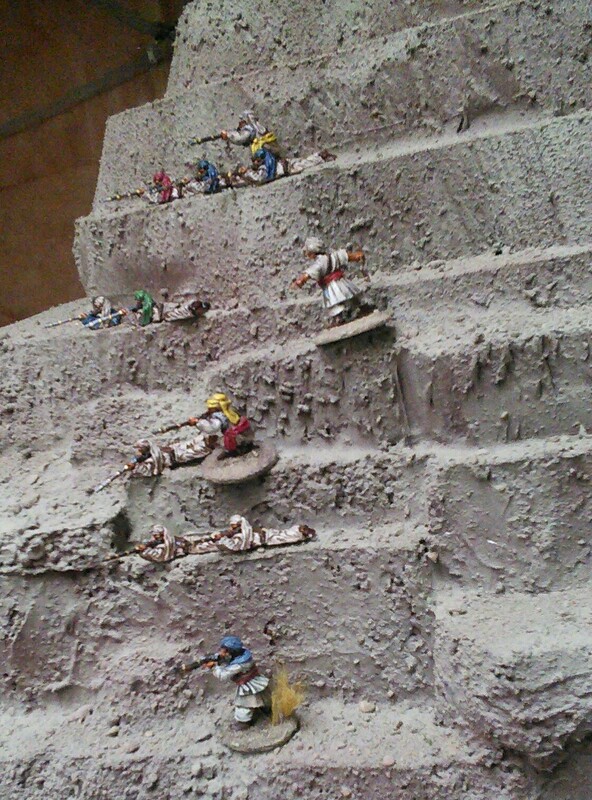 Dwarves and Elves are still forces to be reckoned with. There is a Dwarf kingdom in Moria and Elves in Hollin (the abandoned wilderness the Fellowship cross before entering Moria). The Istari have arrived to rally the Free Peoples, the Nazgul are stirring. I can use my early feudal troops for the men. The Black Company is obviously in the service of the Witch King. With the others I might think about new banners and perhaps replacing the Crusader heater shields with Norman kite shields. 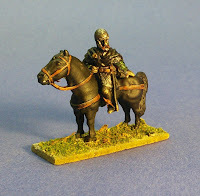 Or I might just paint up some more Normans. 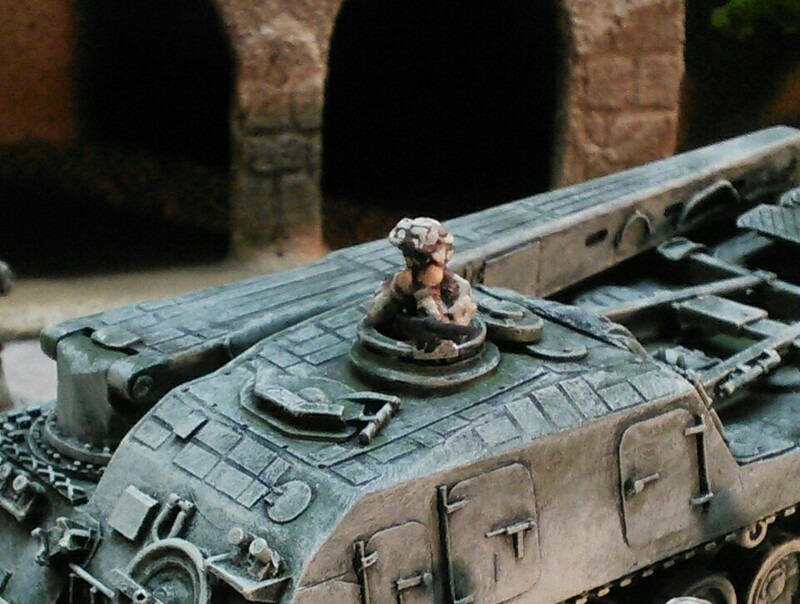 Although my men only have crossbows as missile troops, so the Elgves will have a decided tactical edge until I can correct that. I'd been thinking a box of the plastic Conquest Norman archers would be good thing to get anyway. 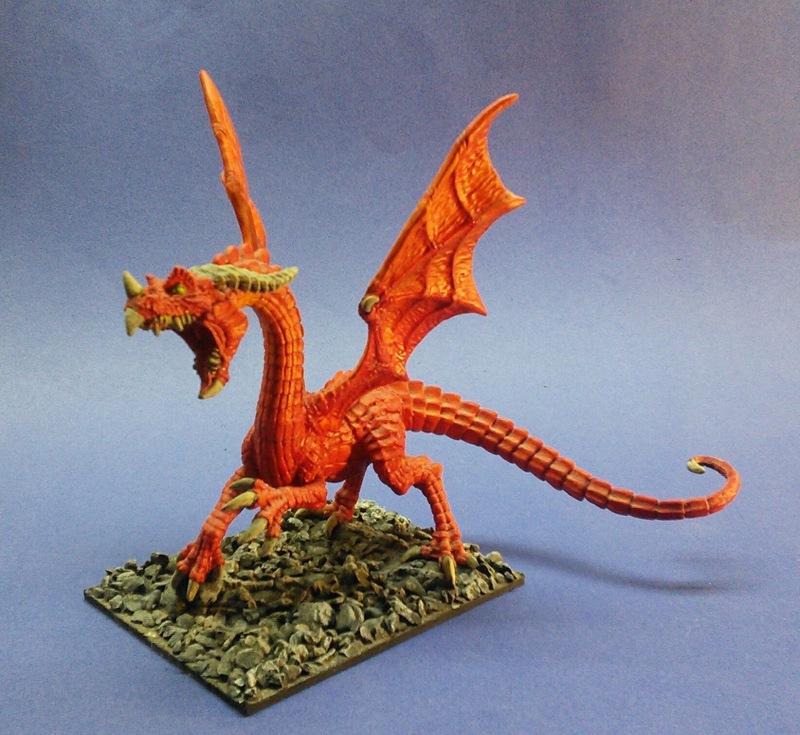 For starters on the fantastic side of things, I've got a lovely Grenadier dragon and an old edition Games Workshop ent, neither of which have ever been in a game. 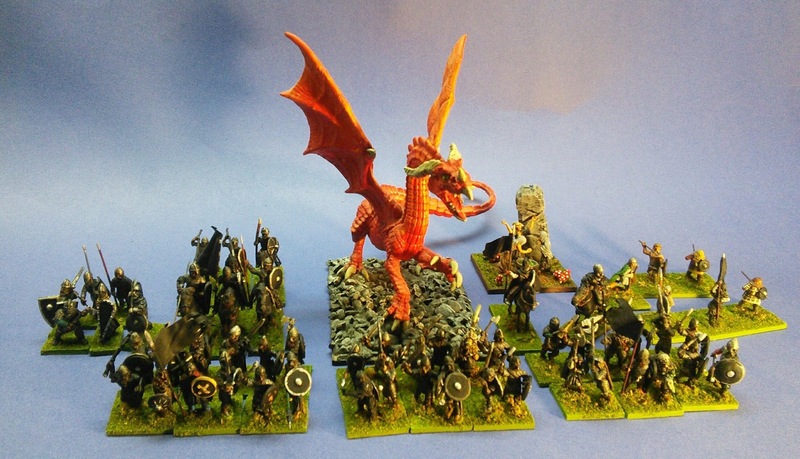 I got them many years ago, in an earlier foray into fantasy gaming with the old plastic Games Workshop High Elves. 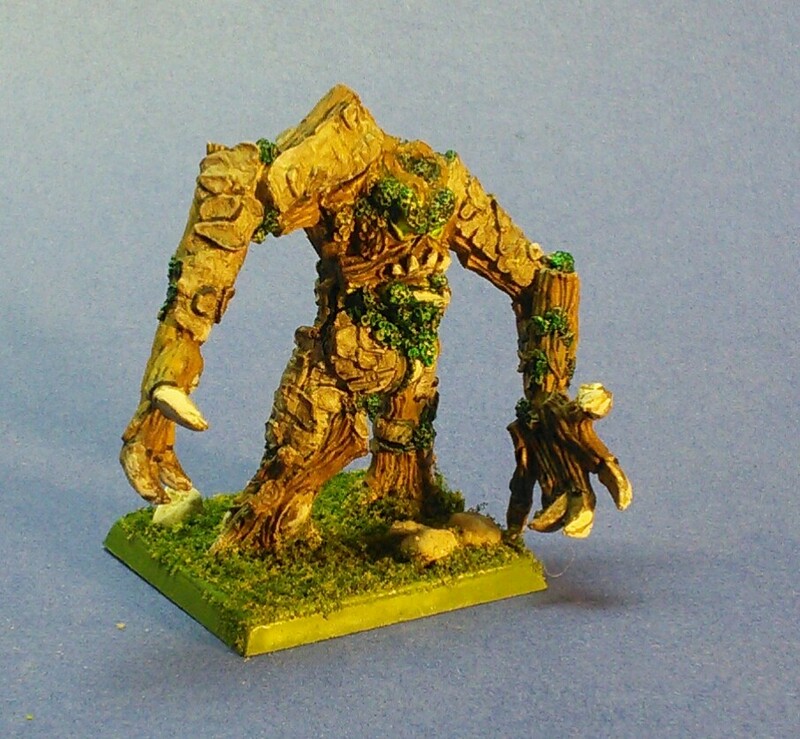 Sold off the elves but kept the ent and dragon because I liked the models and I was quite pleased with the work I'd done on them. Not a bad start. 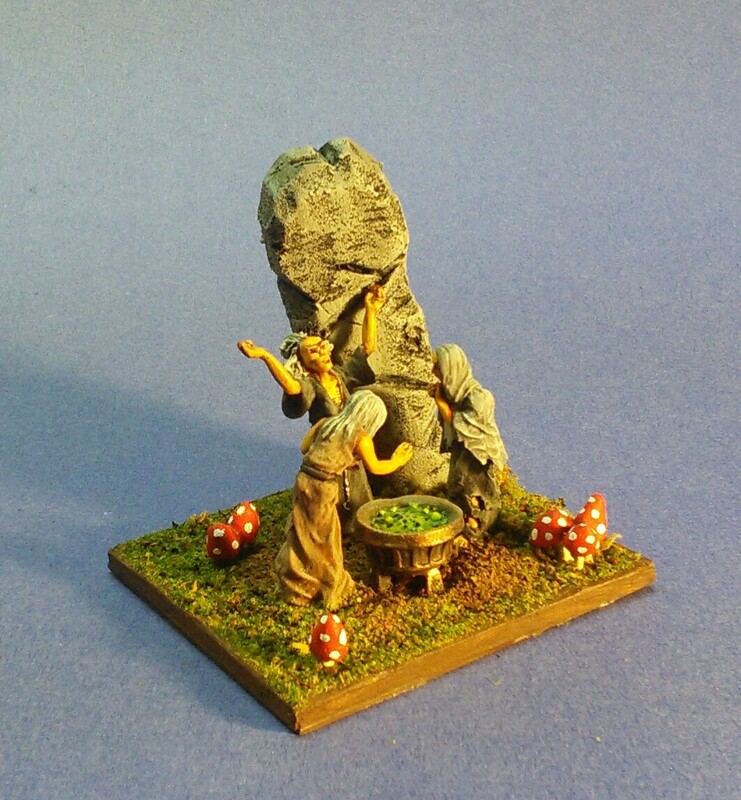 Add some armoured elite foot and heroes to the Elves. Get a couple of units of Dwarves and add allies from my existing feudal troops for men and there's probably a couple of decent forces to start with for the Good Guys (plus I have an unpainted Gandalf in the lead pile!). 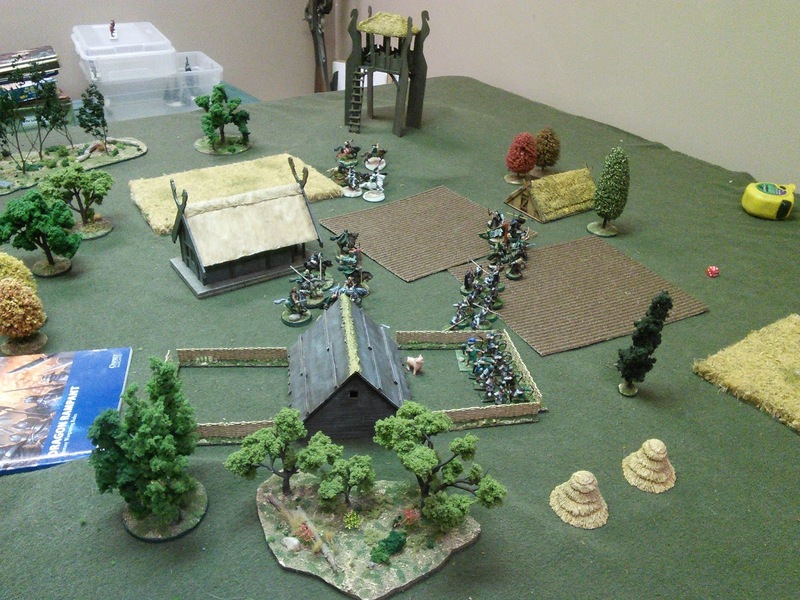 Then for the Bad Guys start accumulating uruks and snagas (big fighting orcs or hobgoblins vs little orcs or goblins) and trolls. The Ettenmoors from which the trolls in the Hobbit came from are in the region, so I'm sure the Witch King would have some in his armies. 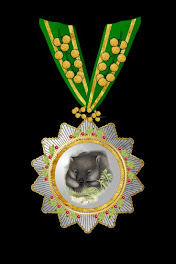 For castles etc. I'd been pondering a Norman style fortification with a stone tower and wooden palisade for years. 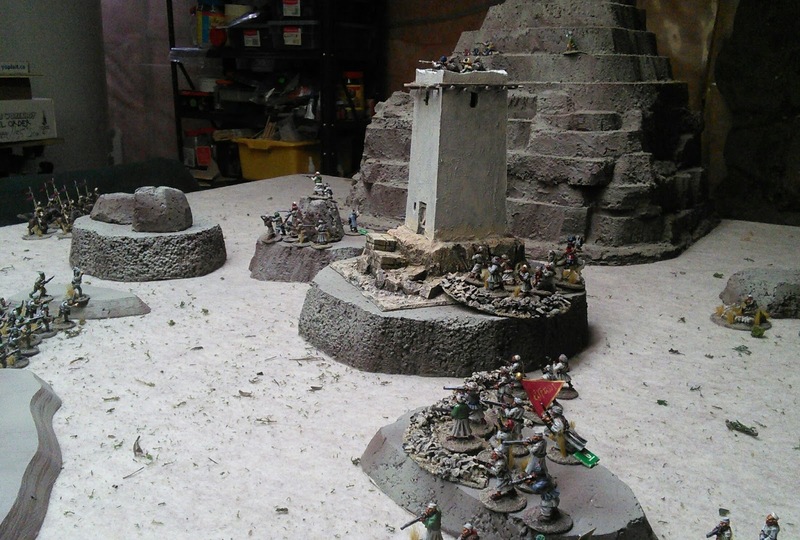 I think this would fit nicely with both straight mediaeval games and the idea of strongholds of men far from the technical expertise of Gondor. I'll have to think more about elvish fortifications and maybe a dwarven outer work or watch tower protecting the approach to the main citadel. Gave my NWF army lists a road test this weekend with Patrick. 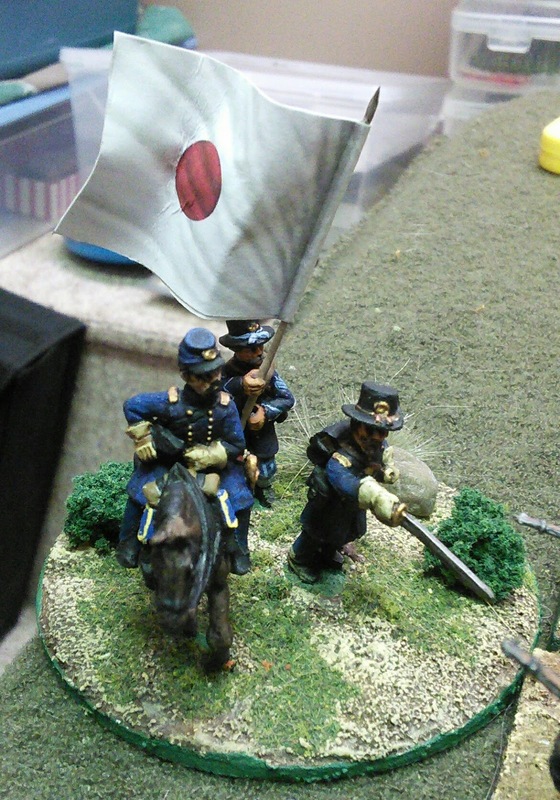 I also wanted to finally give some cavalry and artillery a try too. 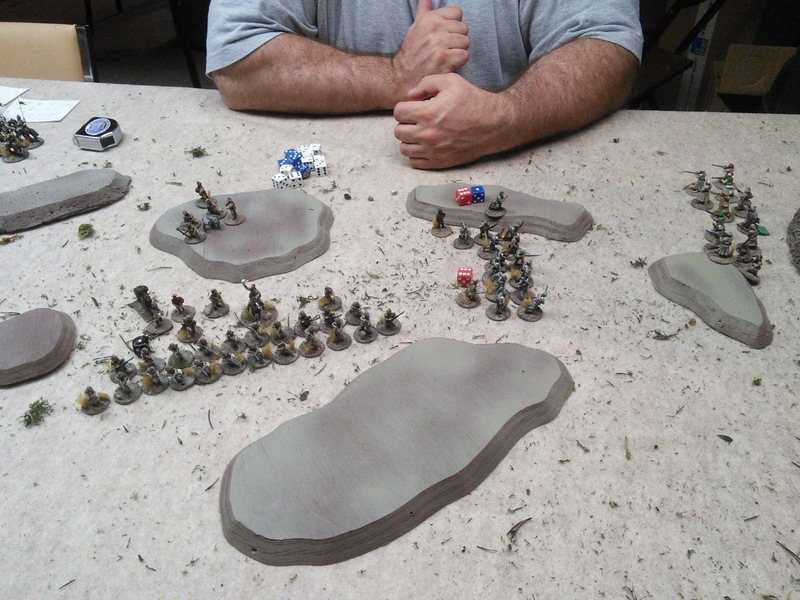 Patrick was new to the rules, and with the other new things I decided upon a straight forward game with a small Imperial force attacking a tower controlling a valley. 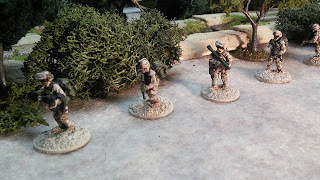 After discussion on the Sharp Practice Facebook page and seeing how few Pathans I got vs. the Anglo-Indian forces, I increased the cost of Imperial infantry by 4 points per group. 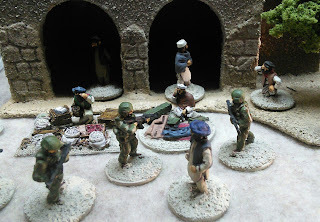 I also ran the Pathans entirely as skirmishers as suggested by one of the group members. For his 10 support points Patrick took a water carrier, an ammunition mule, a Chaplain and upgraded his artillery commander to level 2. For my 5 support points I took 5 sangars. 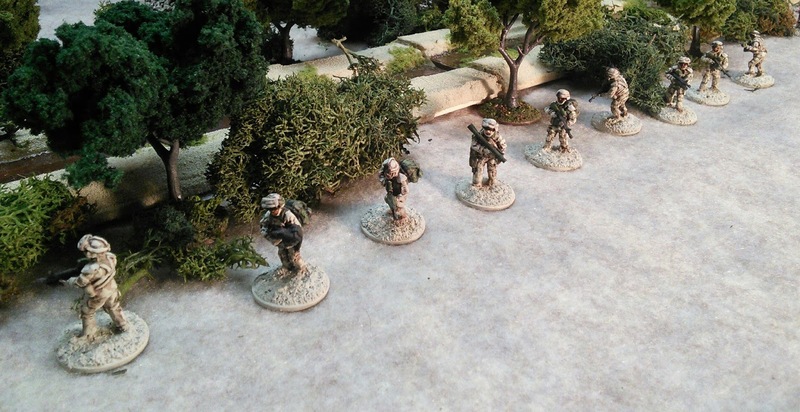 Although a Holy Man or secondary Deployment Point would have come in handy. My DP was behind the tower and out of sight so as my formations came on they were able to deploy with the sangars on either side of the tower. One group occupied the tower. 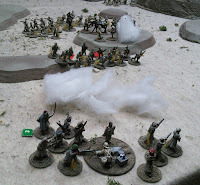 Another formation went up the mountain on my right to snipe at the British. Two other formations went left. 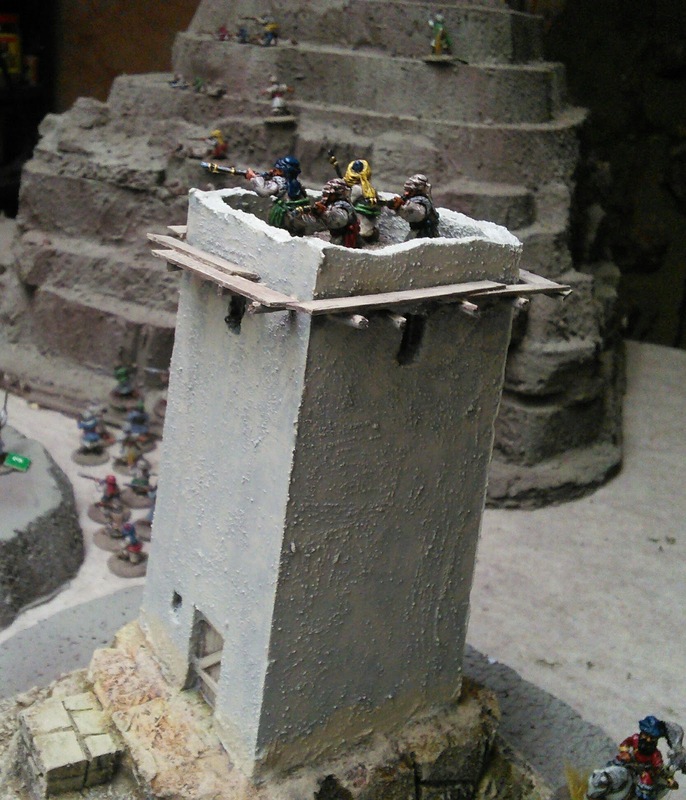 The Gurkhas came on first and pushed straight to the tower. 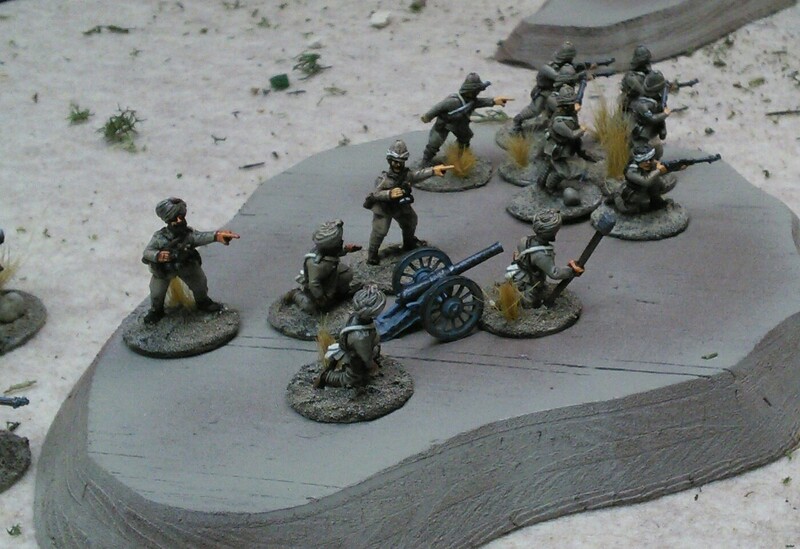 Patrick deployed the screw gun to support them on a small knoll. 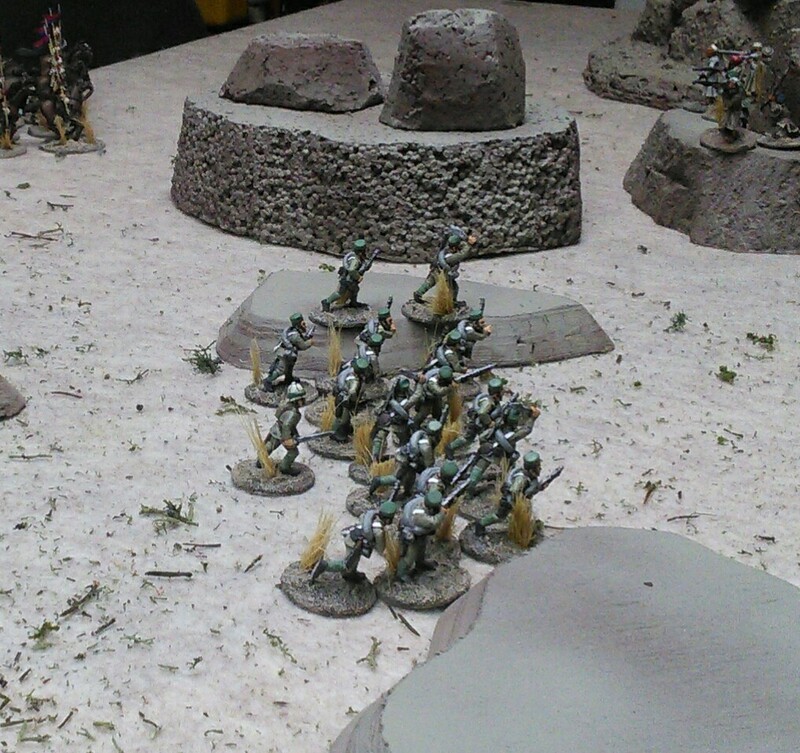 The Lancers went to his left to contest the narrow defiles at the foot of the mountain. 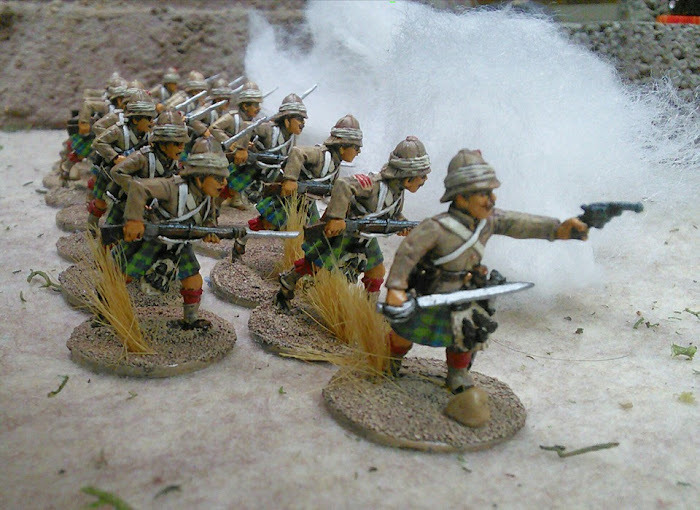 The British infantry formed a firing line in front of the gun. 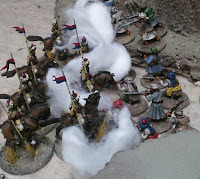 As the Lancers maneuvered to get ready to charge they had a few saddles emptied by musketry from the defile and the mountain side. 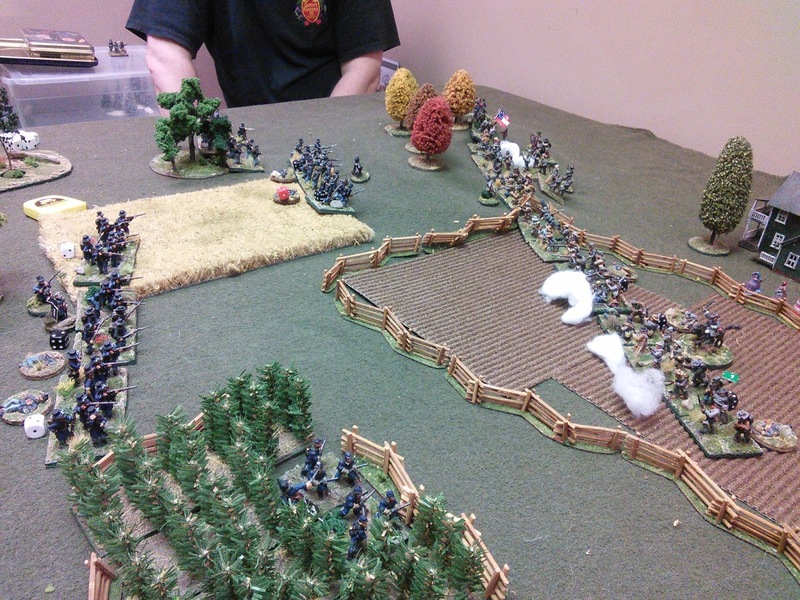 Meanwhile I had pushed a formation out to my left to try and attack the British from the open ground. The Screw gun quickly swung into action and blasted them with canister. 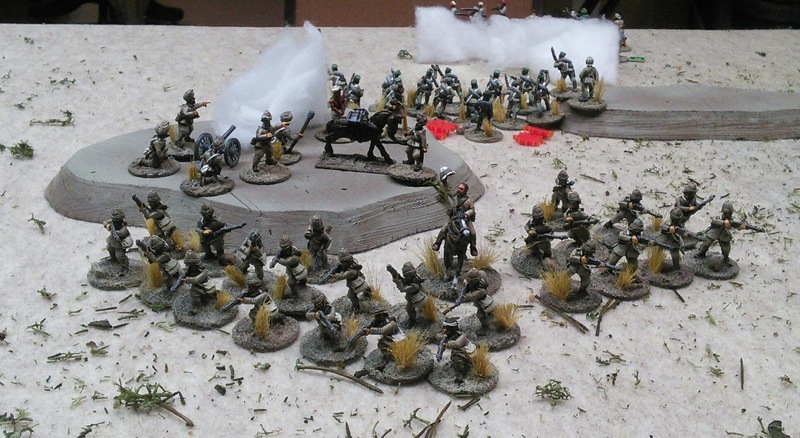 The British infantry then formed a firing line and unloaded a couple of volleys before they could activate. The 4 survivors out of the 12 man formation fled away with about 28 shock points and no leader! The Lancers then charged down the defile before my tribesmen could reload (thus the dramatic musket smoke). Surprisingly, my tribesmen were only defeated 4 to 3. I could afford to lose 4 tribesmen, whereas losing 3 Lancers hurt Patrick very badly. 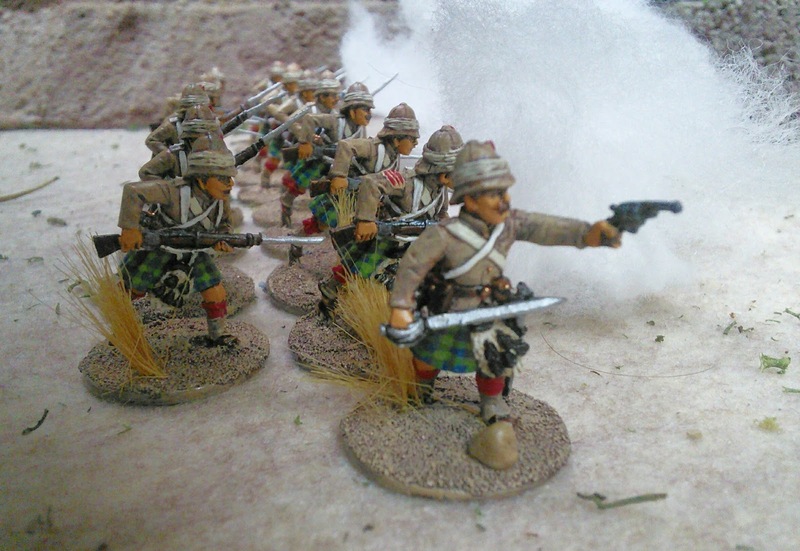 More musketry as they retired reduced the unit even further to one sowar and the Big Man. This allowed me to shift two formations out of their sangars and start sweeping around the Imperial left. The Gurkhas had retired with excess shock after a bitter firefight with the tribesmen in and around the tower. 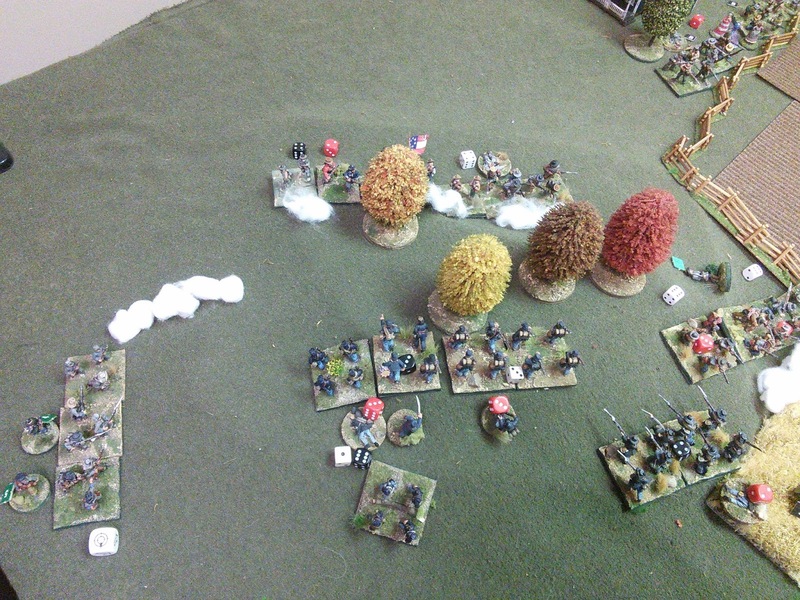 So they started shifting to cover the Imperial left flank. 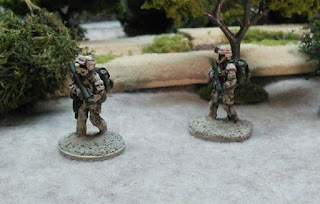 But I was able to get two groups to swoop down on the Imperial Deployment Point, dramatically butchering camp followers. A Random Event left them with a fortuitously covering Pall of Smoke between them and the Gurkhas. 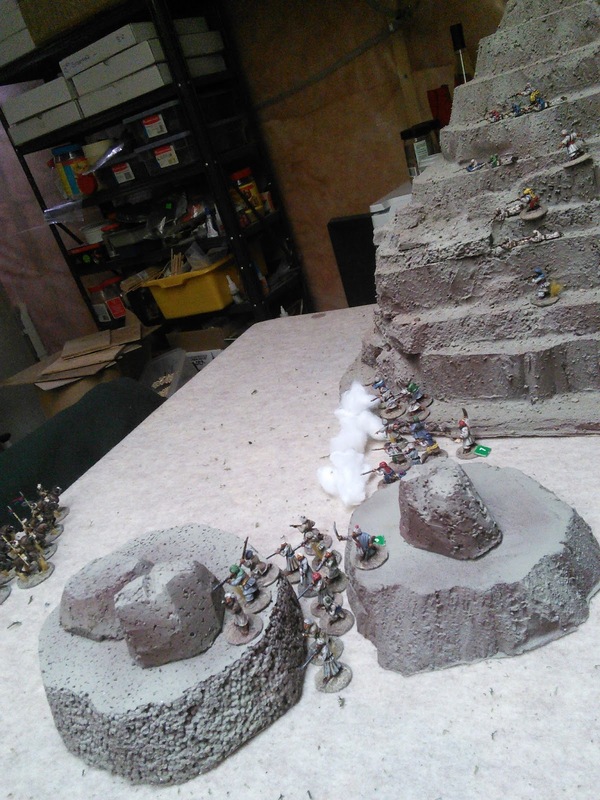 In the meantime, I was also sending another formation of two groups further to my left to outflank the Imperials from the big hill overlooking their right flank too. British getting outflanked on their right too! It was getting late by this time and the Imperial force was down to 6 or 7 Force Morale, and I was only down to 9. Time for the British to retire back to the main column. So far so good I thought. The points seem balanced. 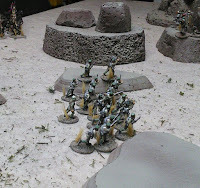 Playing an entirely skirmisher army is interesting. I could have been more aggressive as the Pathan player too I think. I let a few opportunities slip by because I was unsure how things would work, and I wanted to see how some situations would play out. 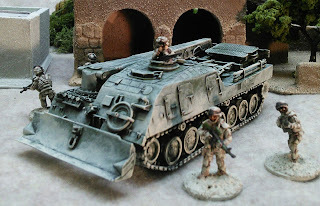 Getting some more troops in the initial list and then purchasing the gun as a Support Option might have been a way to go too. 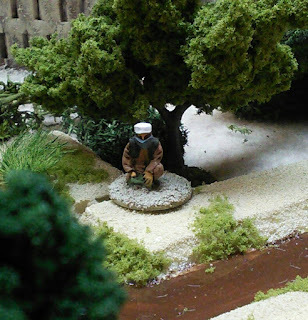 Although the Chaplain did rally several shock off the Gurkhas keeping them in the game. A few things I had started before the Elheim Figures arrived and distracted me. 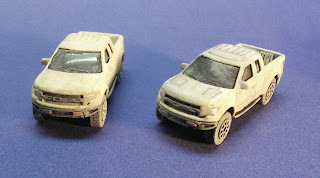 I finished painting those two die cast pickup trucks. They've made appearances in previous games but I thought I'd get them done. The factory finish gloss red was a bit alarming and I'm pretty sure the Taliban had some rules about car colours. One truck was originally going to be an IED casualty, but I decided having an extra civilian vehicle or Taliban troop carrier available would be a Good Thing. One truck got a black undercoat and I used thin grey for the creases. The second truck got gessoed white and then light brown undercoat before the white. Both then got covered in a good layer of dust. 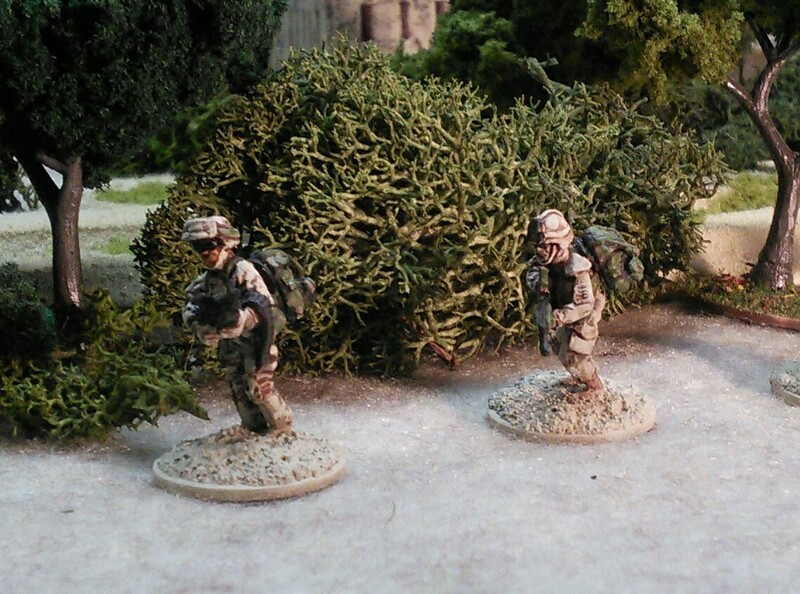 Next up are two battalions of Austrians. Some Old Glory grenadiers and some Lancashire musketeers, plus a Lancashire general and a Peter Pig ammunition wagon from his American Revolution range. 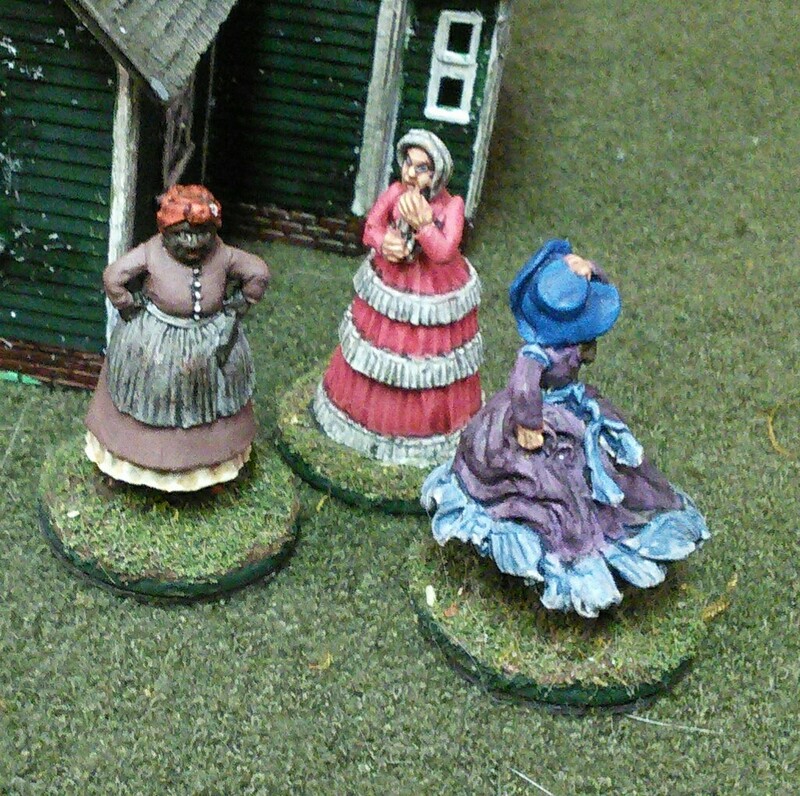 The Lancashire figures are OK. The metal is softer and the detail isn't as good but I got them at a good price. The flag staff seems a bit on the long side though. I need to boost the Grenzers and the cavalry next. The lazy days of summer have proven annoyingly busy for the Mad Padre and I. But I was able to get up to his for an overnight gaming visit this weekend. After dinner on Friday (delayed by me being trapped on hwy 400 amidst the migrating hordes heading to cottages) we played the mega-boardgame War of the Ring again. This time I took Sauron and unleashed my Doom upon the kingdoms of elves and men. And bespoke dice, you can increase your dice pool by bringing fellows like Saruman or the Witch King into play. The production values are certainly very high. 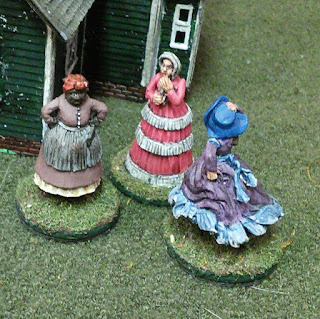 Mike is slowly painting the character figures. 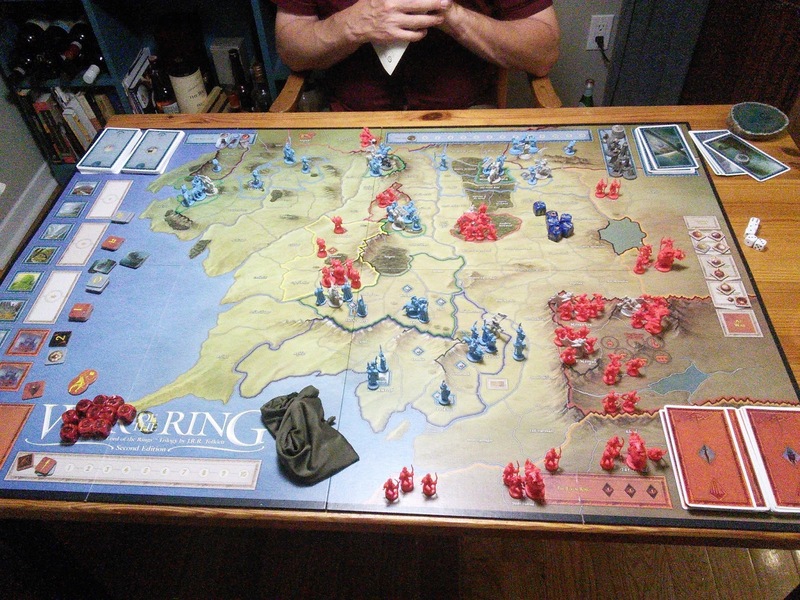 I decided to try and hammer Gondor, but you also have to balance searching for the Ring, which draws off dice and your ability to do things like muster troops and move armies. Mike took an interesting strategy and sent Gimli and Legolas off to rally their kin, while Aragorn and Gandalf moved to Minas Tirith. For more Doom, I managed to activate the Balrog in Moria. 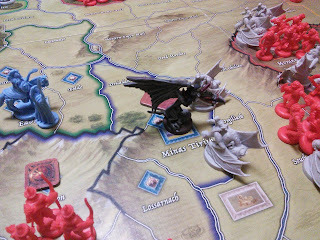 At the same time I sent the Witch King and other Nazgul to hunt in the area for the Fellowship. Holy crap! 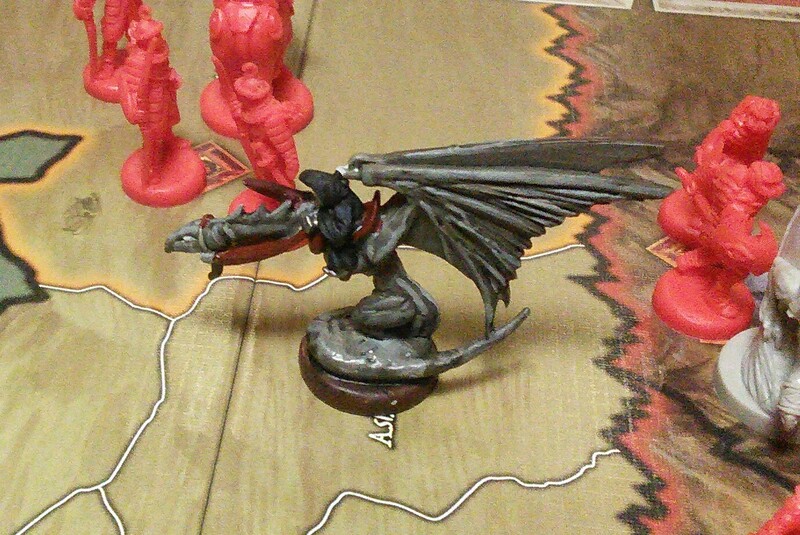 It's a frikken' Balrog! This scared the willies out of Mike as we both had visions of a Balrog led attack from Moria on Lothlorien. But getting the beast to move was very hard and proved unattainable this game. Meanwhile there was a totally epic siege of Minas Tirith with Aragorn and Gandalf stiffening the defences, until the Witch King's Morgul legions swarmed over the walls. 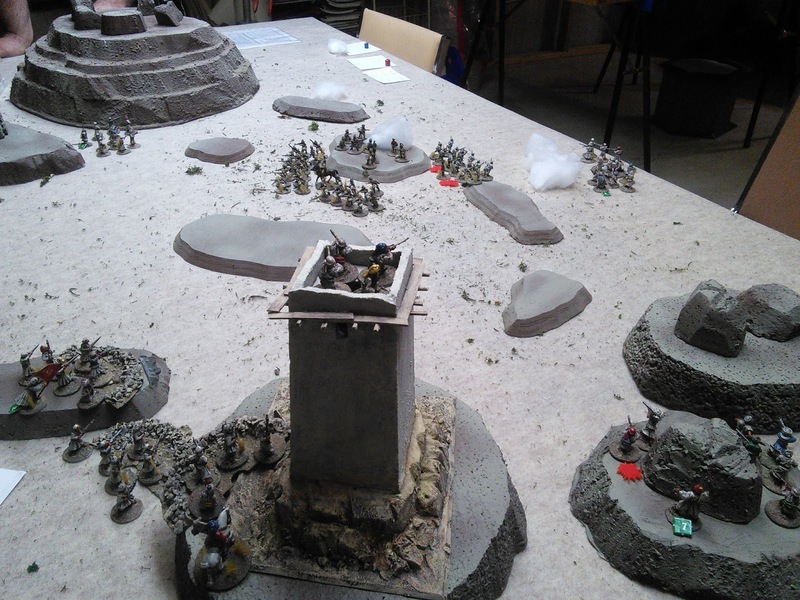 I played Wormtongue to keep Rohan immobilised and had armies poised to crush Dol Amaroth and the last Gondorim, along with the weakly defended Edoras and Helm's Deep. Meanwhile, Legolas was leading the elves of Mirkwood to attack and lay siege to Dol Guldur, before I could attack Lothlorien. 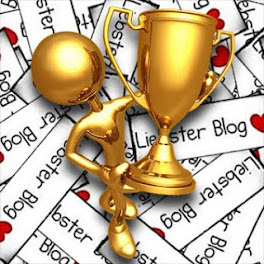 And that was my high watermark. 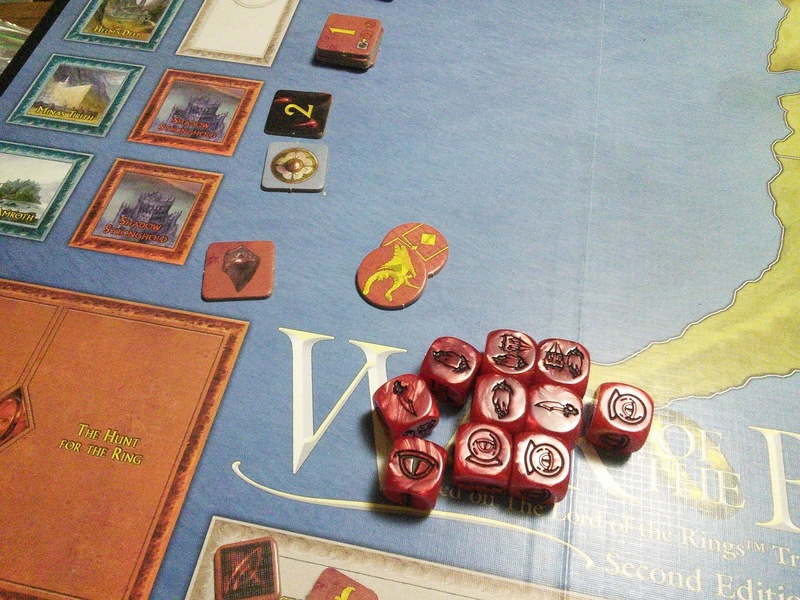 My dice frustrated me for a critical turn and the the Fellowship got into Mordor and the focus of the game suddenly shifted. My efforts to hunt the Fellowship were for naught and Frodo dropped the Ring into Mount Doom. So interesting. Quite complex. Lots of Tolkien chrome and details. Many interesting decisions to weigh. Takes a long time to set up and play. It was around 2 AM when we toddled off to bed. Saturday morning we were joined by another Mike to play Sharp Practice with the Padre's ACW troops. 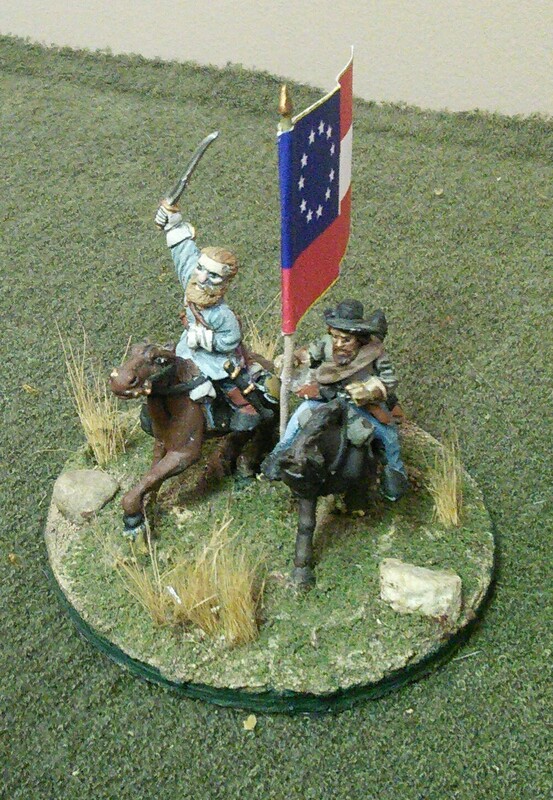 I played the Union with the two Mikes playing the Rebs. 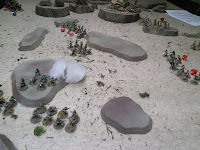 Eventually we got a couple of battle lines formed and merrily blazing away at each other. I started out giving controlled vollies which are quite effective, but eventually I found I just wanted to get rounds downrange as quickly as possible. 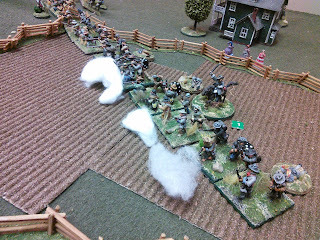 The weight of my musketry combined with the skirmishers in the cornfield eventually told upon the rebs in the ploughed field, driving them back in disarray. 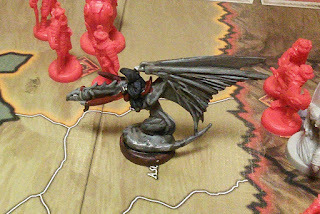 A few turns with their colonel being unconscious from a Union Minnie ball helped me a lot, since he could only watch the shock mount up. 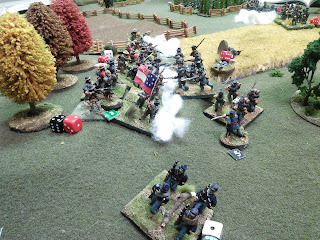 Things went quite spectacularly badly for me on the other flank though. 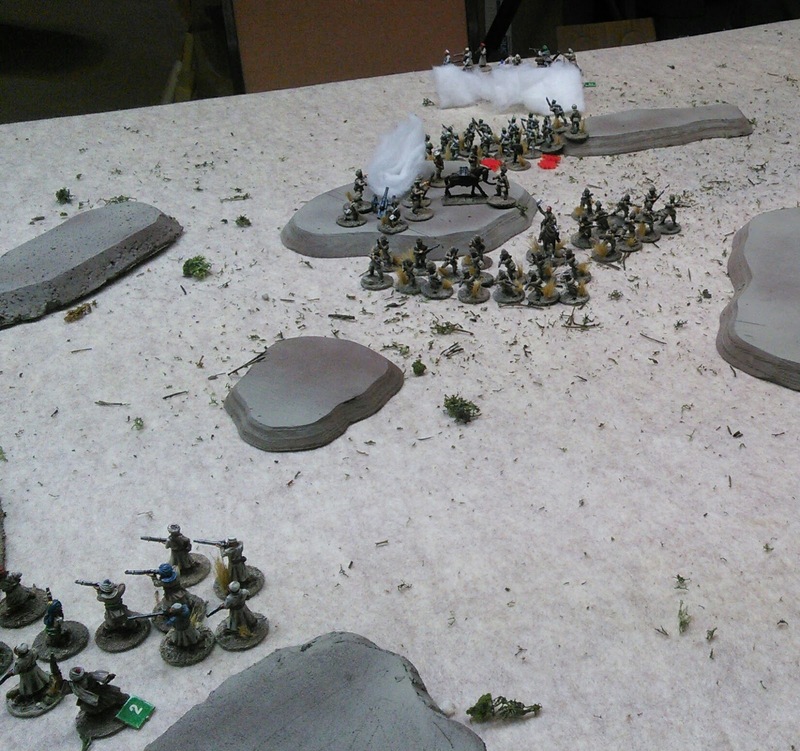 I had pushed a three group formation up the hill to fire fight through the trees with a two group formation of Rebs. Meanwhile a Reb skirmish group which had been shot up withdrew behind the hill and after recovering shock it formed up with another skirmish group. 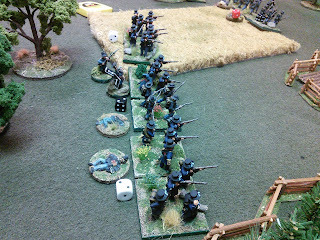 The Other Mike then swung this skirmish formation onto my flank to great effect. In the above picture my flank group is withdrawing quite shot up. Black and white dice are shock, red dice and casualty figures are kills. It went badly for me. The formation in my centre had also fared badly, losing a group and their Big Man got killed by a random event. 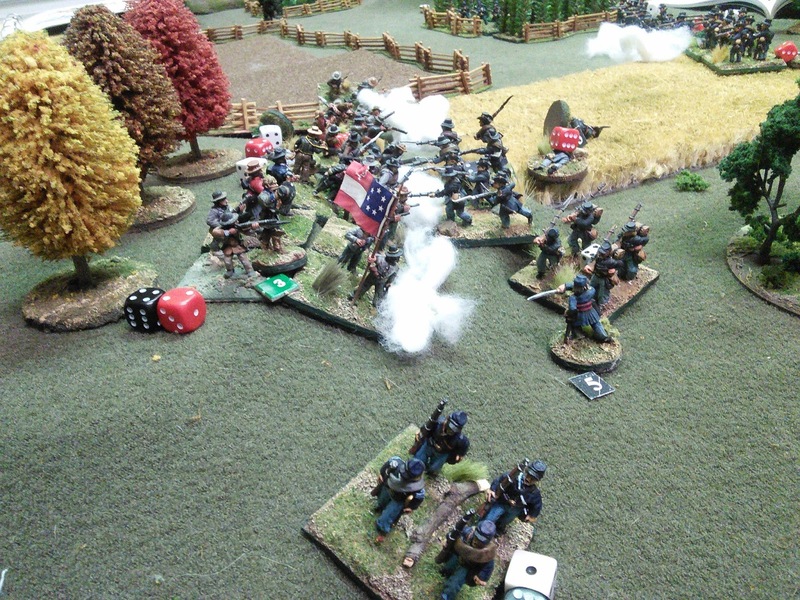 We hadn't been tracking Force Morale but a quick calculation at this point had the Force Morale standing at 1 for the Union and 5 for the Rebs. After a quick tidy of the table we gave Dragon Rampant a go with the Padre's Lord of the Rings kit. The forces of Isengard were descending upon a village in the West Fold. Burn the buildings and capture the pig. The usual evil objectives. 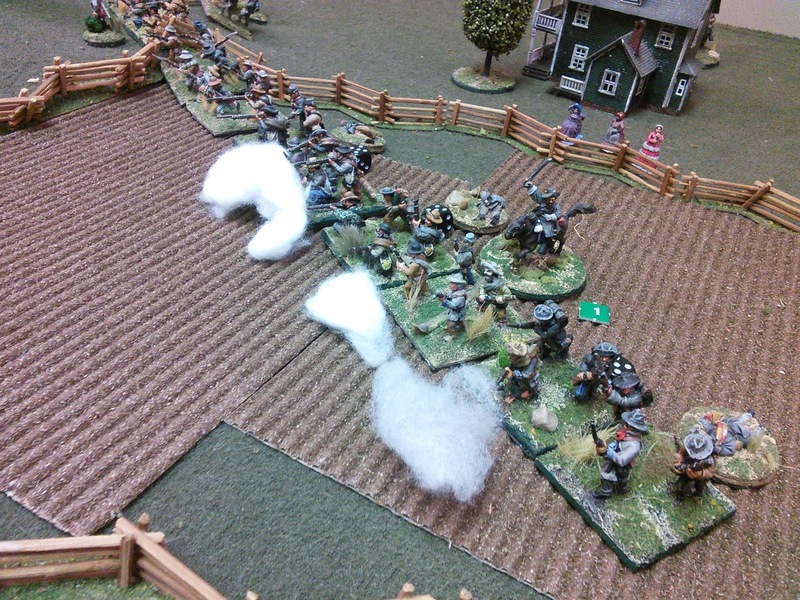 Being familiar with Lion Rampant made the game rattle along briskly. 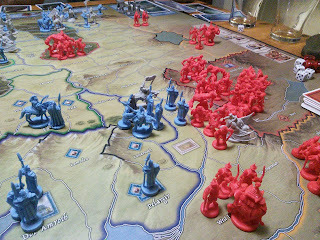 I didn't get Aragorn into things, he was busy trying to outflank the Orc line with some Rohirrim. 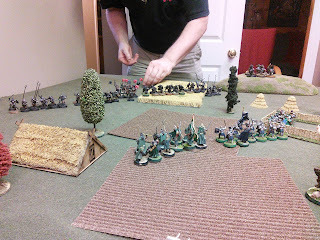 In the meantime Gimli charged into a unit of Orc berserkers to save my crumbling centre and Eomer charged into the Warg riders. Gimli wracked up a big score of dead Orcs and Eomer was victorious. The bowmen protecting Bakonraed the Pig thought they were going down under Orcish spears but fell back and drove the Uruks off with a final desperate volley. The Orc Shaman did a bit of magic, but it wasn't overwhelming. We didn't try any monsters though. So I was pleased and intrigued. And unlike GW games where you have to swallow the back story and not using something leaves you at a decided disadvantage, if something like a particular spell doesn't fit the back story then don't use it. Then it was dinner and with everyone at their cottages the highway was open, giving me a breezy drive home listening to Randy Bachman's Vinyl Tap and Saturday Night Blues on CBC 1. Where they Gordons or Black Watch? And I couldn't remember.... and I didn't care. I remember when I was painting my SYW Prussian army and doing my best to get the facings, hat lace and even the very tiny cockades at the corners of their tricornes correct for each regiment. Not sure I could be bothered now. 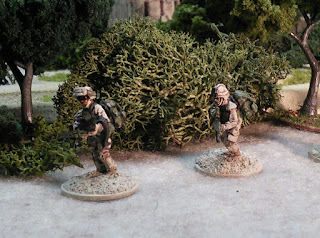 Platoon Weapons Detachment and more! My Carl Gustav team and GPMG team, plus additional fire team members, a second ANA section, and assorted local characters are done! 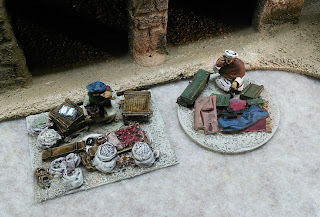 I finally got the Afghan merchant with goods that I'd gotten a long time back ( last October when I'd ordered the big influx of Taliban reinforcements) done up while painting the dickers. 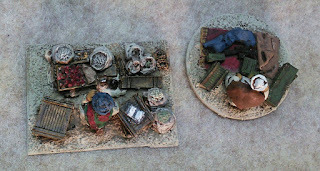 One of the dickers is sitting talking on a cell phone so I used some spare boxes and an extra weapons cache to make him an arms merchant. 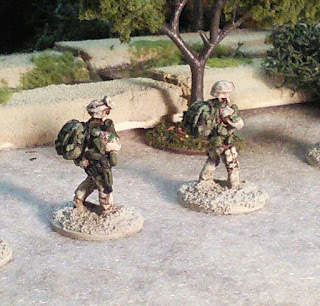 Maybe he's calling a customer or getting the grocery list to bring home, maybe he's reporting the location of the ISAF patrol? I added some boxes to the War Time Figures merchant too. After priming I realised the top box had some old glue so I made the book out of folded paper to cover that up. I hope to be able to build in some aspect of questioning the locals and maybe having the ANA or the interpreter along will boost the intelligence gathering.